De narrativas, e autenticidade - mesmo onde menos se suspeita dela. Revisitamos sobre o mesmo tema: antifas, class war... em funny style? That one of the most ridiculed music fandoms could become progressive protagonists in a serious political battle does, admittedly, sound like the punch line to a bad joke - in a year that has so consistently challenged the boundary between satire and reality. Juggalos. Da primeira vez que lhes demos a atenção -merecida, não a descartável- foi por uma peça de março que por coincidência é repescada aqui hoje via um outro artigo que a cita, e sabem como processamos coincidências: sobem pelo radar like a muthafucka. A base do artigo: Juggalos e Insane Clown Posse como identidade de classe. The Insane Clown Posse’s horrific imagery evokes the wretchedness of life in postindustrial landscapes, where ugliness and decay exist alongside hopelessness and alienation. Juggalos affirm that these broader structures of exploitation - and not any personal inadequacies - determined their failures, and ICP’s music replaces ugly desperation with acceptance and camaraderie. The figure of the Juggalo, in other words, turns the shame of a damaged life into power. The Juggalos’ day of action nevertheless represents a demand for recognition and equality. A mostly impoverished community will gather in the nation’s capital to wave their middle fingers at a system of power that has pushed them to the margins of society, then targeted them for managing to survive. The demonstration’s participants come into view as a community worth defending - and perhaps even an exemplar, however unlikely, of class solidarity. If we bracket their hatchet-wielding, face-painting, Faygo-spraying theatrics - and any other cultural trappings that allow so many outsiders to feel smugly superior to ICP’s acolytes - we are left with a working-class community acutely aware of, and actively resisting, its profound alienation and social rejection. The Juggalo community shows how effectively class can bring people together. Its members have constructed theatrical identities as ninjas and hatchet-wielding clowns determined to fight oppression - and have a good time in the process. Such playful imagery expresses the frustration any poor or marginalized person feels when attempting to resist the indifference and quiet violence of those in power. Their followers were the outcasts, misfits, and fuckups in high school, considered too ugly or freakish to sit at the cool kids’ table. They are the cashiers at Walmart and the servers at McDonald’s, spectacles of misfortune either ignored or blithely exploited for cheap laughs. They live a life of menial labor that elite ideology insists they deserve. The point of all of this is that ICP represents a very real socioeconomic viewpoint within the downtrodden, post-industrial milieu that city, there was (and remains) real economic pain. In turn, that leads to social pain, which then leads to Insane Clown Posse. So, now that we've established that ICP is worth vaguely respecting from an abstract standpoint, let's go back to the issue of taste, or ICP's non-relation to it. Getting into Insane Clown Posse is incredibly difficult. This is not because Insane Clown Posse is "bad," per se; it's just that Insane Clown Posse does not conform to the conventional notions of taste as you or I understand them. De uma minoria espezinhada a apropriar-se de uma identidade e consolidar a sua cultura. That mockery is deeply bound up in who Juggalos are: largely lower-class whites, particularly in the Midwest and South. Juggalos tend to be poor and uneducated, from economically depressed small towns and broken homes. To use an inelegant term, proper folks tend to find Juggalos gross, disturbing on a biological level. Aware of society’s opinion of them, Juggalos see themselves as part of a family that must look out for itself because no one else will. It’s a genuine community that accepts those who would otherwise be cast aside and allows the marginalized to express themselves without fear of ridicule. It’s sutured itself together through members’ shared understanding of their status as the dregs of society, a genuine example of class-consciousness that any socialist should admire. Whereas many contemporary musicians fake class consciousness by dressing the part and aestheticizing poverty, ICP have constructed an elaborate narrative that embraces horror, fantasy, and sexual deviance to articulate the ugliness of class exploitation. 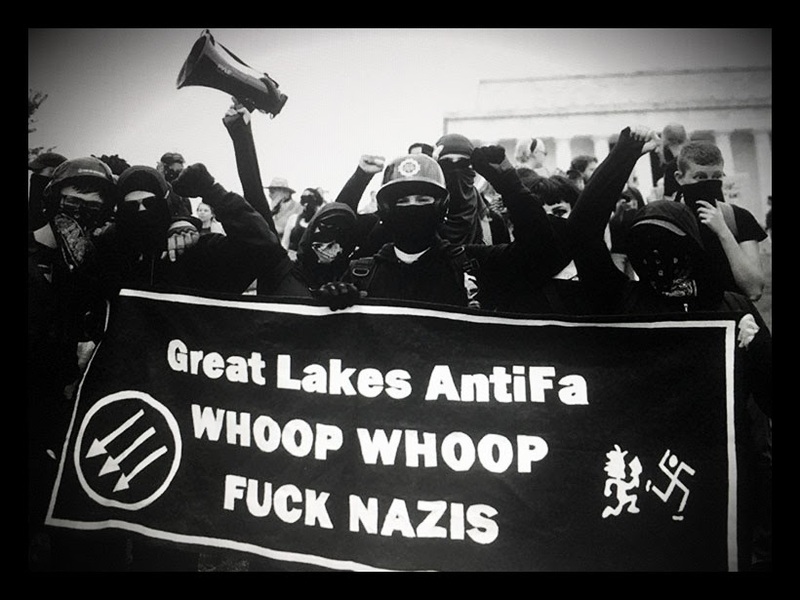 The Juggalo March on Washington presents the Left with an opportunity to start building [uma] coalition that exchanges the battle of cultural authenticity for the battle against oppression. The lyrics found within ICP songs resonate with the working class, so although you will find Juggalos from all walks of life, the vast majority are highly class-conscious proletarians. There are numerous Juggalo Antifa who we were keen to support this action. We promoted the Juggalo March extensively on our networks and organized to attend the event in solidarity - we offer our support to those targeted disproportionately by law enforcement using these unjust tactics. It is this potentially low socio-economic status which makes them easily targeted by law enforcement for exploitation. The police and F. B. I. overreach and targeting of Juggalos is a classic example of fascism. Something we can certainly relate to in the wake of news that Antifa are being illegitimately targeted as a gang and as a terrorist organization by the federal government. You don’t have to like ICP’s music but you can recognize that these young men and women have found themselves, after generations of structural inequality, at the margins of an economic system that has intentionally pushed them aside in order to maximize profit. They did not turn on each other but instead came together, recognizing their shared interests. They have used this knowledge not just to throw a raucous yearly festival, but also to organize a march against a federal agency that stands for state violence. Of course, the Juggalo community suffers from its share of racism, sexism, and homophobia. But regardless of its foibles, the mythology the Juggalos have embraced captures, and facilitates resistance to, the exploitation that structures the lives of poor and working-class people. If the idea of socialists linking arms with Juggalos still sounds absurd, perhaps a little ridiculousness - a clownish embrace - is exactly what we need in the age of Trump. In a way, ICP and the Juggalos are the perfect group to challenge Trumpism. They’re a fiercely anti-racist movement based in working-class, mostly white communities. That gives them a legitimacy and credibility in combatting racist sentiment that more traditional political actors lack.